A pioneer in bioelectronics and mechanical engineering will join Northwestern’s research and teaching faculty in 2016 after a large donation from trustees to fund the new Center for Bio-Integrated Electronics. John Rogers received the Louis Simpson and Kimberly Querrey Professor of Materials Science and Engineering, Biomedical Engineering and Medicine position at NU after 18 years at the University of Illinois at Urbana-Champaign where he wrote more than 450 research papers. University trustees Simpson and Querrey gave a gift to NU’s “We Will” fundraising campaign when they learned Rogers was considering coming to NU, increasing their total donation to $125.8 million, $25 million of which will fund the new center. Rogers’ principal appointment will be in the McCormick School of Engineering, with an additional appointment at the Feinberg School of Medicine. Because UIUC doesn’t have a medical school, Rogers has had to conduct research off-campus. Now that he’s moving to Feinberg, he says he’s looking forward to working directly in a medical environment. 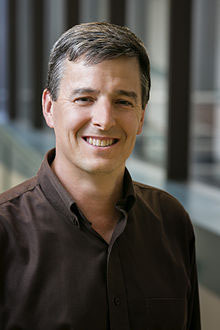 Rogers, who earned a Ph.D. in physical chemistry from the Massachusetts Institute of Technology in 1995, joined Illinois as a technical staff member in the Condensed Matter Physics Department and became the program’s director three years later. In 2005, he met former Illinois Prof. and current NU Prof. Yonggang Huang, who became his research partner. “Prof. Huang and I have simply had a magnificent partnership in bioelectronics,” Rogers said. During their five years of active collaboration, Rogers and Huang created the electronic tattoo, a temporary tattoo that relays information about the brain, heart or muscle movement directly to an outside electric source, including a smartphone or hospital monitors, allowing patient data to be recorded wirelessly. Its serpentine design allows the device, powered by linked solar collectors, to be as elastic and resilient as skin cells. “Flexibility is the key difference between any electronics and bioelectronics. You can’t stick rigid plastic onto the human body,” Huang said. In addition to devising the electronic tattoo with Huang, Rogers holds more than 80 patents, with more than 50 still in use. Rogers currently holds the highest chaired position at the University of Illinois. He also founded the Rogers Research Group, which studies nanomaterials, and earned the 2011 Lemelson-MIT award for his work in nanotechnology, along with the 2013 Smithsonian Ingenuity Award. In 2015, Rogers was inducted into the National Academy of Sciences and he currently serves as the director of the Frederick Seitz Materials Research Laboratory. At McCormick, Rogers will not only be conducting research, but will also be teaching. He will also be maintaining connections with the University of Illinois that will allow him to work with students in Champaign. Julio Ottino, the dean of McCormick, is confident Rogers will reach out to a vast majority of McCormick students, while continuing to transform bioelectronics.